Great Horned Owl hit by a car, rescued off the speed bumps from the side of the interstate by a very benevolent state trooper on his way home the eve of Thanksgiving. A few phone calls later, I call him to find out he’s on his way home to place the owl in a pet carrier. Imagine that car ride! 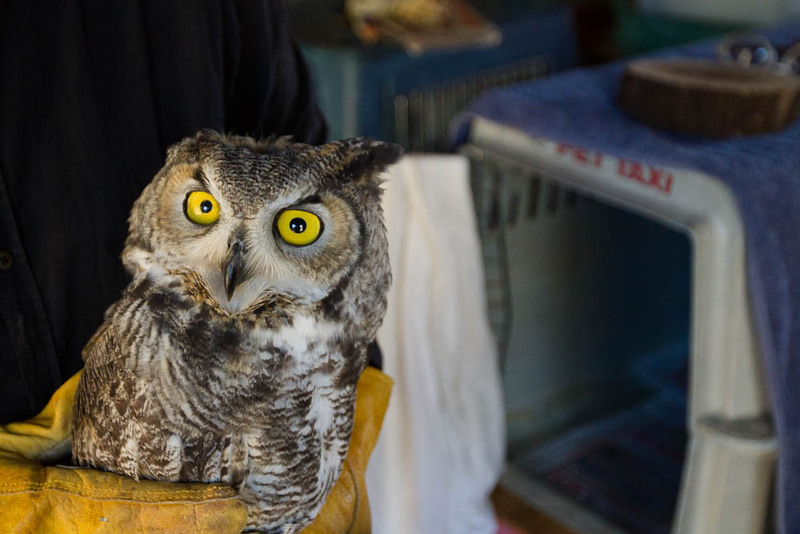 After picking up the owl, who is quiet, alert and responsive, clenched right foot, with all other injuries on the right side: eye closed, missing ear tuft feathers, and an exposed patch of skin on his head, all sustained from the collision. We give him time to rest overnight and in the wee small hours of the morning of Thanks-Giving, hand feed a few pieces of cut up mouse “meals” (gratitude to these animals in the web of life!) over the next 36 hours. Through out the day, the eye opens and the morning after we’ve given thanks, he unclenches that right foot! Many many heartfelt thanks to the trooper who cared enough to give him a second chance. We felt so blessed to be a “port in the storm”..
Later that same morning, we transport him to Liberty Wildlife as his injuries needed their expert care and resources. At last report, he is doing well! There will be more to this story…Please check back in with us!